The 2014–15 Russian Premier League is the 23rd season of the Russian football championship since the dissolution of the Soviet Union and the 13th under the current Russian Premier League name. All statistics correct as of 7 June 2015. The season began on August 1, 2014, when Rubin Kazan opened its season at home against Spartak Moscow. The season ended on May 29, 2015. Zenit won the championship, on 17 May, 2 rounds before the season ended. After the 2013–14 season, FC Anzhi Makhachkala and FC Volga Nizhny Novgorod were relegated to the 2014–15 Russian National Football League. Anzhi's relegation was confirmed on 11 May 2014 after losing 0–1 to FC Krasnodar, a result that came one year after the club finished third in the previous season, and thus returns to FNL after five seasons. FC Volga Nizhny Novgorod has been relegated after playing in the Russian Premier League for three seasons, during its first stint in Russia's top division. They have been replaced by two clubs which directly qualified from the 2013–14 Russian National Football League. FC Mordovia Saransk returned to the Premier League at its first attempt as FNL champions in the 2013–14 season, after being relegated from the Premier League in the season before. And 2013-14 FNL runner-up FC Arsenal Tula, which make their debut in Premier League for 2014–15 season, to play in top division of any level for the first time in its 68-year history. On 18th and 22nd May 2014, FC Tom Tomsk and FC Krylia Sovetov Samara also played their relegation playoff matches against FC Ufa and FC Torpedo Moscow respectively. The 2012-13 season FNL runner-up which has been directly promoted to Premier League sason before, FC Tom Tomsk lost their relegation playoffs from FC Ufa (4th 2013-14 FNL) with 4–6 on aggregate. Ufa's qualification to the Premier League was all the more impressive considering that the club was founded at the end of 2010 and played its 2011–12 season in the second division. FC Krylia Sovetov Samara were also relegated to play in FNL in 2014–15 season, after they lose from FC Torpedo Moscow (3rd 2013-14 FNL) with 0–2 on aggregate, and the Moscow-based club will return to Premier League for the first time since the 2006 season. FC Krylia Sovetov Samara, as one of founding members of Russia's first division since breakup of the Soviet Union, will be playing outside top division for the first time since 1991. Lokomotiv, Moscow 2002 28,800 2,000  Used as home ground in round 26. MSA Lokomotiv, Moscow 2009 10,000 1,300  Used as home ground in round 20. Rubin, Kazan 1958 10,000 3,682  Used as home ground in rounds 18-27. Central Stadium, Kazan 1960 28,856 20,624  Used as home ground in round 1. Sultan Bilimkhanov Stadium, Grozny 1946 10,600 8,500  Used as home ground in rounds 18, 24. Eduard Streltsov Stadium, Moscow 1959 13,450 3,517  Used as home ground in rounds 14, 17, 26-30. Otkrytiye Arena, Moscow 2014 45,360 20,147  Used as home ground in round 20. Start, Saransk 2004 11,613 1,964  Used as home ground in rounds 19-23, 30. Zvezda, Perm 1969 17,000 1,383  Used as home ground in rounds 5, 11, 13, 24-26. Petrovsky, Saint Petersburg 1925 20,985 16,925  Used as home ground in round 28. Geolog, Tyumen 1982 12,057 5,167  Used as home ground in rounds 23, 27, 28. Ural Indoor Arena, Yekaterinburg 3,000 2,640  Used as home ground in rounds 11, 20, 21. The teams that finish 15th and 16th will be relegated to the RNFL, while the top 2 in that league will be promoted to the Premier League for the 2015–16 season. The 13th and 14th Premier League teams will play the 4th and 3rd FNL teams respectively in two playoff games with the winners securing Premier League spots for the 2015–16 season. 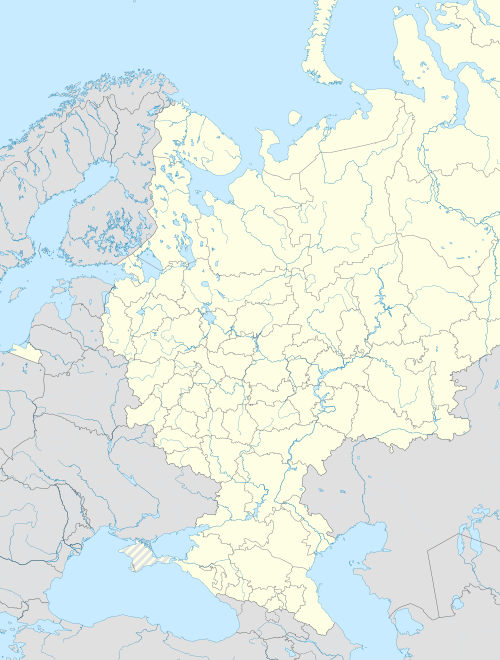 ^ Lokomotiv Moscow qualified for Europa League group stage by winning the 2014–15 Russian Cup. Ural Sverdlovsk Oblast won 1–0 on aggregate score and remained in the 2015–16 Russian Premier League. Rostov won 5–1 on aggregate score and remained in the 2015–16 Russian Premier League. The table lists the positions of teams after each week of matches. In order to preserve chronological evolvements, any postponed matches are not included to the round at which they were originally scheduled, but added to the full round they were played immediately afterwards. For example, if a match is scheduled for matchday 10, but then postponed and played between days 25 and 26, it will be added to the standings for day 25. On 16 March 2015, the league decided that the game between FC Arsenal Tula and PFC CSKA Moscow on 21 March 2015 can not be played at Arsenal Stadium due to unacceptable pitch condition. The backup stadium registered by Arsenal with the league for such occasions is MSA Lokomotiv in Moscow, where the game was moved, in effect making Arsenal visitors at their own home game. In protest, Arsenal manager Dmitri Alenichev decided to field the reserves squad for this game. Most of the players from the reserves teams are registered to play in league games, therefore the league could not reverse such a decision. 9 of the 11 Arsenal starters in the game (except for Sergei Kotov and Leonid Boyev) made their Premier League debut in the game. Kotov and Boyev had played in the Premier League for 185 combined minutes before this game. It was also a first game since 21 July 2012 in which one of the teams (in this case, Arsenal) did not play a single foreign player. CSKA won the game 4–1. In the first round of matches, the 16 clubs (10 of which scored) combined for 34 goals to open the Russian Premier League, a new record that was elapsed even prior to Terek Grozny's home match against Amkar Perm on August 4. Ten of those goals came in Dinamo Moskva's 7-3 victory over FC Rostov. Zenit started the competition with 8 victories in a row, beating the previous record set by FC Rubin Kazan in 2008 with 7. ^ a b "Стадионы – Звезда". Чемпионат (in Russian). Retrieved 24 June 2015. ^ "Стадионы – Арсенал". Чемпионат (in Russian). Retrieved 24 June 2015. ^ a b "Стадионы – Локомотив". Чемпионат (in Russian). Retrieved 24 June 2015. ^ "Стадионы – Локомотив МСА". Чемпионат (in Russian). Retrieved 24 June 2015. ^ a b "Стадионы – Арена Химки". Чемпионат (in Russian). Retrieved 24 June 2015. ^ a b "Стадионы – Кубань". Чемпионат (in Russian). Retrieved 24 June 2015. ^ a b "Стадионы – Старт". Чемпионат (in Russian). Retrieved 24 June 2015. ^ "Стадионы – Олимп-2". Чемпионат (in Russian). Retrieved 24 June 2015. ^ "Стадионы – Казань-Арена". Чемпионат (in Russian). Retrieved 24 June 2015. ^ "Стадионы – Рубин". Чемпионат (in Russian). Retrieved 24 June 2015. ^ "Стадионы – Центральный". Чемпионат (in Russian). Retrieved 24 June 2015. ^ a b "Стадионы – Открытие Арена". Чемпионат (in Russian). Retrieved 24 June 2015. ^ "Стадионы – Ахмат-Арена". Чемпионат (in Russian). Retrieved 24 June 2015. ^ "Стадионы – имени Султана Билимханова". Чемпионат (in Russian). Retrieved 24 June 2015. ^ "Стадионы – Сатурн". Чемпионат (in Russian). Retrieved 24 June 2015. ^ "Стадионы – имени Эдуарда Стрельцова". Чемпионат (in Russian). Retrieved 24 June 2015. ^ "Стадионы – Динамо". Чемпионат (in Russian). Retrieved 24 June 2015. ^ a b "Стадионы – Петровский". Чемпионат (in Russian). Retrieved 24 June 2015. ^ "Стадионы – Геолог". Чемпионат (in Russian). Retrieved 24 June 2015. ^ "Стадионы – Урал - манеж". Чемпионат (in Russian). Retrieved 24 June 2015. ^ У "МОРДОВИИ" БУДЕТ НОВЫЙ ГЛАВНЫЙ ТРЕНЕР (in Russian). FC Mordovia Saransk. 18 May 2014. ^ ДОБРО ПОЖАЛОВАТЬ, ЮРИЙ ПАВЛОВИЧ! (in Russian). FC Mordovia Saransk. 28 May 2014. ^ Должность главного тренера "Спартака" вакантна. У Гунько кончился контракт (in Russian). Sport Express. 1 June 2014. ^ МУРАТ ЯКИН — НОВЫЙ ГЛАВНЫЙ ТРЕНЕР "СПАРТАКА" (in Russian). FC Spartak Moscow. 16 June 2014. ^ АЛЕКСАНДР БОРОДЮК ПОКИДАЕТ "ТОРПЕДО МОСКВА" (in Russian). FC Torpedo Moscow. 5 June 2014. ^ АЛЕКСАНДР ТУКМАНОВ: НИКОЛАЙ САВИЧЕВ БУДЕТ ВОЗГЛАВЛЯТЬ "ТОРПЕДО" В РФПЛ (in Russian). FC Torpedo Moscow. 19 June 2014. ^ Славолюб Муслин – новый главный тренер "Амкара" (in Russian). FC Amkar Perm. 17 June 2014. ^ Заявление Совета директоров ФК «Локомотив» (in Russian). FC Lokomotiv Moscow. 18 September 2014. ^ Божович покидает «Ростов» (in Russian). FC Rostov. 25 September 2014. ^ Игорь Гамула главный тренер «Ростова» (in Russian). FC Rostov. 29 September 2014. ^ ВАЛЕРИЙ ПЕТРАКОВ – ГЛАВНЫЙ ТРЕНЕР «ТОРПЕДО» (in Russian). FC Torpedo Moscow. 4 November 2014. ^ ВИКТОР ГАНЧАРЕНКО ПОКИДАЕТ «КУБАНЬ» (in Russian). FC Kuban Krasnodar. 13 November 2014. ^ ЛЕОНИД КУЧУК ВОЗГЛАВИЛ «КУБАНЬ» (in Russian). FC Kuban Krasnodar. 17 November 2014. ^ Информационное сообщение (in Russian). FC Amkar Perm. 9 December 2014. ^ "Гаджи Гаджиев – новый главный тренер «Амкара»" (in Russian). FC Amkar Perm. 30 December 2014. ^ Гамула и Маслов вернулись в молодежную команду (in Russian). FC Rostov. 18 December 2014. ^ КУРБАН БЕРДЫЕВ ГЛАВНЫЙ ТРЕНЕР «РОСТОВА» (in Russian). FC Rostov. 18 December 2014. ^ Миодраг Божович подал в отставку (in Russian). FC Lokomotiv Moscow. 11 May 2015. ^ Новым главным тренером «Локомотива» станет Игорь Черевченко (in Russian). FC Lokomotiv Moscow. 2 June 2015. ^ ЛЕОНИД КУЧУК ПОКИДАЕТ «КУБАНЬ» (in Russian). FC Kuban Krasnodar. 25 May 2015. ^ "Стадион «Арсенал» закрыт для игры с ЦСКА" (in Russian). Russian Football Premier League. 16 March 2015. ^ "ДМИТРИЙ АЛЕНИЧЕВ: «ТУЛУ ЛИШИЛИ ГРАНДИОЗНОГО ПРАЗДНИКА»" (in Russian). FC Arsenal Tula. 18 March 2015. ^ "Арсенал 1:4 ЦСКА" (in Russian). livesport.ru. 21 March 2015. ^ "ПАТРИОТИЧНЫЕ" (in Russian). Sport Express. 23 March 2015. ^ "Arsenal - CSKA game report" (in Russian). Russian Football Premier League. 21 March 2015. ^ "Rubin - Spartak Game Report" (in Russian). Russian Football Premier League. 1 August 2014. ^ "Russian Premier League top goalscorers". Sport Express. 2 May 2015. ^ "Dinamo Moscow 7-2 Rostov". uk.soccerway.com. Soccerway. Retrieved 3 August 2014. ^ "CSKA-Rostov game protocol". Russian Premier League. 31 August 2014. ^ "Rostov-Zenit game protocol". Russian Premier League. 20 September 2014. ^ "Zenit-Ural game protocol". Russian Premier League. 7 March 2015. ^ ""ЗЕНИТ" УСТАНОВИЛ НОВЫЙ РЕКОРД РОССИИ: 8 ПОБЕД НА СТАРТЕ ЧЕМПИОНАТА" (in Russian). Sport Express. 20 September 2014. ^ Список 33-х лучших футболистов (in Russian). Russian Football Union. 24 June 2015. Retrieved 10 April 2018.